Dan Kinsella was appointed Deputy Chief of Operations for Hamilton Police Service in October, 2016, and is responsible for the Service’s three Patrol Divisions and Investigative Services Division. As a proud member of the Hamilton Police Service for over 32 years, Deputy Kinsella's career developed through the ranks, having served in Uniform Patrol, Emergency Response, Training, Communications and Investigative Services. A McMaster University graduate, Deputy Kinsella has a Bachelor of Arts Degree in Labour Studies and holds a Master Degree in Criminal Justice. In his commitment to ongoing education, Deputy Kinsella has completed numerous courses at both the Ontario and Canadian Police Colleges. He graduated from the Police Leadership Program at the Rotman School of Management in Toronto and the FBI National Academy at Quantico, Virginia. He is a recipient of the Canadian Order of Merit for Police Forces and Queen Elizabeth II Diamond Jubilee Medal. Deputy Kinsella is a Member of the Canadian Association of Chiefs of Police and the International Association of Chiefs of Police. 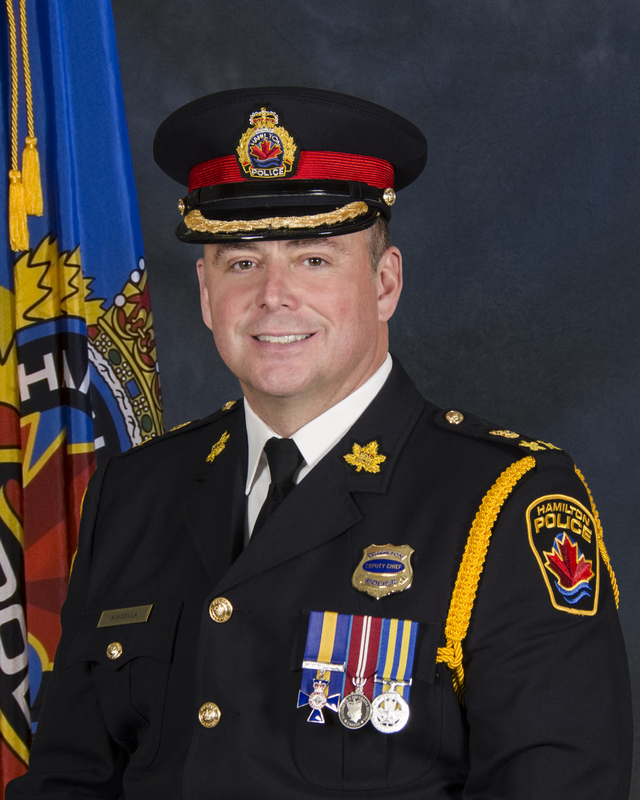 He is currently the Zone 4 Director of the Ontario Association of Chiefs of Police, the Chair of the OCAP Public/Private Security Liaison Committee, the Past President of the FBI National Academy Associates New York State/Eastern Canada Chapter, and serves on the Canadian Police College Advisory Board. Being passionate and committed to the safety and well-being of all Hamiltonians, he is also a Member of the Hamilton Drug Strategy Coordinating Committee. As an active member in the community, Deputy Kinsella is a current Hamilton representative and Past President of the John Howard Society of Hamilton-Burlington. He also has been a Board member with Banyan Community Services and the Hamilton Police Service’s in-house charity, Project Concern. As part of that service, Deputy Kinsella was the Chairperson of the It’s a Kids Christmas for a number of years. In 2018, he proudly completed a 700 km bike ride from Alymer to Ottawa in the Canadian Police Memorial Ride to Remember, in honour of fallen officers.